Emory University was founded in 1915 as a Methodist school in conjunction with the strong support of Atlanta's Candler family and their Coca-Cola wealth. 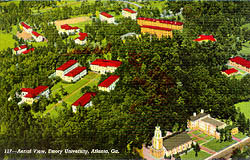 The campus of Emory University was designed by Henry Hornbostel of New York. Here Hornbostel created a natural garden campus with Georgia-marble buildings of modern Italianate design. The landscape of the campus is tied to that of the Olmsted-designed residential community of Druid Hills, adjacent to the campus. Prior to the establishment of Emory, Asa Candler disputed the extent of control the Methodist Church should have over Vanderbilt University before he would contribute funds to that institution. As a result Candler initially endowed Emory with a million dollars as well as contributing property in Druid Hills for the campus. 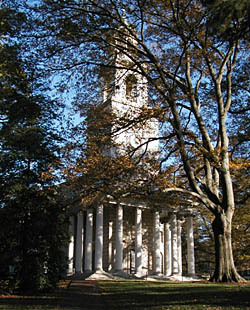 The university was an outgrowth of Emory College at Oxford, which started as a Georgia Conference Methodist Manual Labor School in 1834. Asa Candler's brother Warren Candler, a Methodist bishop, served as the first chancellor of Emory. In his design for the Emory campus and its buildings, Hornbostel incorporated the natural growth of dogwood and pine trees with the winding roads and small bridges over ravines--in harmony with the surrounding landscape of Druid Hills. The Emory buildings, characteristic of Hornbostel, were designed with a modern approach to a traditional style. The use of the block form buildings with wide eaves and arched windows in combination with pink and gray Georgia marble in a random "quilt-like" pattern suggests the forms of Italian villas and buildings characteristic of Renaissance Tuscany. By using indigenous materials, such as the culls of quarried Georgia marble slabs, and by integrating the building into the landscape, Hornbostel created a series of buildings that complimented their surroundings. The Emory University District is roughly bounded by N. Decatur Rd, Oxford Rd, Dickey Dr., Kilgo Cir., and Asbury Dr. The campus, comprising nine different colleges, is generally open to the public; tours are not offered regularly but can be arranged through the admission offices. The Michael C. Carlos Museum at 571 Kilgo St. is located on Emory University campus and houses a permanent collection of over 15,000 objects, spanning nearly 9,000 years from prehistoric cultures to the 20th century. Visit the Emory University website for further information.